... yet the truth about Amber may surprise you. What most people know as the aroma of "Amber" is actually not real petrified Amber at all. 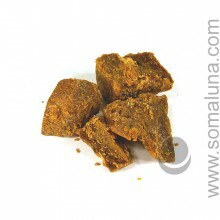 It is usually a combination of Liquid Benzoin or Styrax Resin with a touch of Vanilla in a base of Beeswax. It is soft and a little oily to the touch and very aromatic, unlike petrified amber which is very hard and has no aroma. Yet time and time again sellers of this concoction claim it comes from high in the Himalyas or other such near-mythical places, or that it is made from ultra-rare Ambergris. Never-the-less, this Amber smells amazing. We call it India Amber, which is where most of it originates from. There are many varieties of this Amber such as Dark Amber which is sweet with a touch of spice and Light Amber which is honey sweet. Usually this Amber from India is not burned on charcoal like most "resins", rather it is left out. Its Aroma is so strong that it will fill a room in no time. We carry nice Rosewood boxes for India Amber complete with filigree holes to let the aroma come out. True Petrified Amber is something completely different from Indian Amber. The Greek name for this amber was elektron, "formed by the sun", and it was connected to the sun god Helios, one of whose titles was Elector or the Awakener. According to the myth, when Helios' son Phaëton was killed, his mourning sisters became poplars, and their tears became the origin of elektron, amber. The ancients also noted that if they rubbed the amber for long enough, they could even get an electric spark to jump. Our word electricity comes from their word for Amber. True Petrified Amber does not smell very remarkable when burned, but we carry it anyway for the purists whose recipes call for true Petrified Amber. This Amber usually comes from Poland, Russia and the Baltic region. We also carry a much better smelling semi-petrified Amber from China. Both are very Solar in their aspects and do well on charcoal as incense. There is also Gold Copal, which is otherwise known as Amber Copal or American Amber. This copal comes from Mexico and nearby regions or from Sumatra, India and Indonesia and is also sometimes semi-petrified. These amber copals have wonderful aroma when burned. We also carry Amber Oil. It has an incredible aroma, and we always have some simmering in an aroma lamp here as we work. It is the same Aroma as the famous Amber from India.